Sushant Singh & Kriti Sanon in Kolkata to promote their upcoming film ‘Raabta’!! Sushant Singh Rajput and Kriti Sanon who are currently promoting their upcoming film Raabta have been doing city promotions since the last few weeks. After traveling to Hyderabad, Ahmedabad and Indore the actors have arrived today at the sweet land of Kolkata. 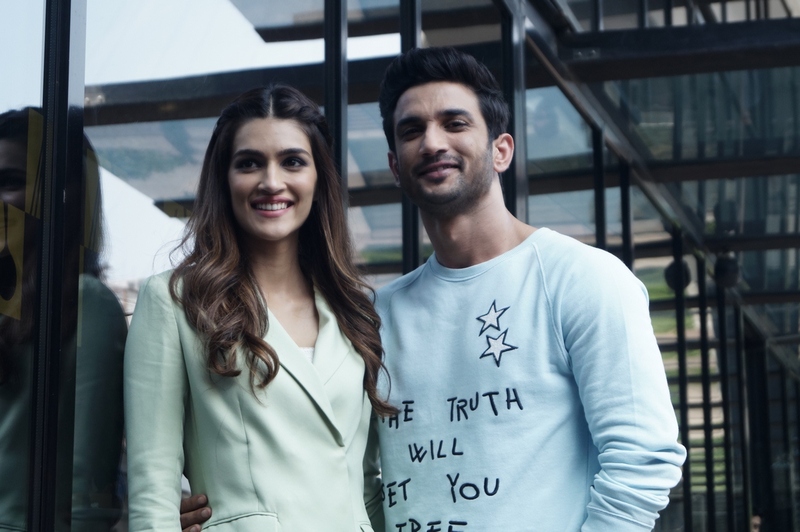 The film has been making a lot of buzz for the content which has been launched so far from the chemistry of Sushant and Kriti to the story and action to the songs of the film. Raabta starring Sushant Singh Rajput, Kriti Sanon and Jim Sarbh marks the debut of Dinesh Vijan as a director. Produced by Dinesh Vijan, Bhushan Kumar and Homi Adajania, the film is all set to release on 9th June 2017. Deepika Padukone will be seen doing a cameo in the title song of the film while Rajkummar Rao will also make a cameo appearance in the film. The film’s trailer has already garnered million views on YouTube. Sushant and Kriti came together and looked striking together. Both Sushant and Kriti were both excited and nervous. Kriti shared how Raabta was a story she had heard even before she got her debut film. The script was not even written and it was just a concept. She felt there is a special connection she has with this film. While on the other hand Sushant confessed he does not believe in such things but the script was powerful and compelling. He shared that as an actor he likes to work on stories which challenge and help him push the envelope. The music of the film has been composed by Pritam, JAM8, Meet Bros and Saurav Roy. The lyrics have been penned by Amitabh Bhattacharya, Irshad Kamil and Kumaar and the film had 5 songs released as singles. The full soundtrack album of the film which includes 7 songs was released by T-Series.